This strange creature was found crossing the busy main road near Regua 09 by Sergeants Viana and Ramos. Looking rather like an alien in need of a strong cup of coffee, it was in fact a brown throated three toed sloth, an ‘endangered’ species which thrives in the protected forests of Regua. Sloths are well known for their very slow nature, sloth being one of the seven deadly sins. Lazy people are also known as slothful. The “endangered” Brown throated three toed sloth (Bradypus variegatus) is one of those magical creatures of the Neotropics. In fact it spans most of northern South America but here in the protected forests of REGUA, it is relatively easy to see. In fact though the sloth spends close to 75% of its time on their preferred trees, hugging them for dear life with its strong claws, it isn`t as slow as one may believe. Sloths are predominantly arboreal, and we often see them in Cecropia plants, a hollow tree that itself has a symbiotic relationship with the Azteca ants. The tree is a pioneer species, so there is never any lack of them for they can be found in the rapidly re-grown forests surrounding us. 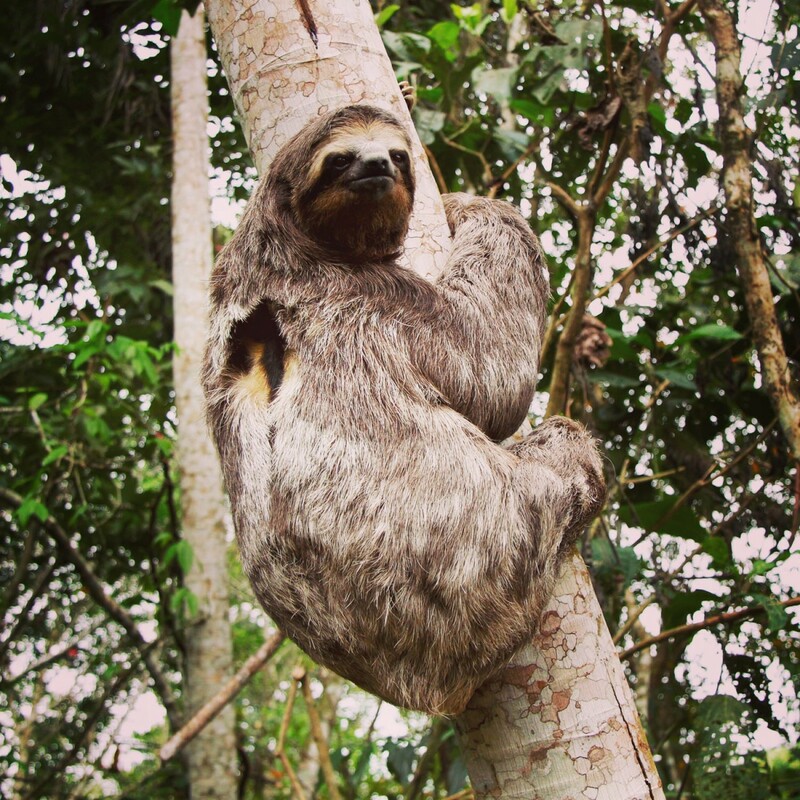 The sloth is often found hanging on these open trees, but are also found in the mature forests that are characteristic of the Atlantic Rainforest. There is also a Maned three toed sloth (Bradypus torquatus) , a real Atlantic Rainforest endemic, but that one has become very rare with forest loss over the last few centuries. 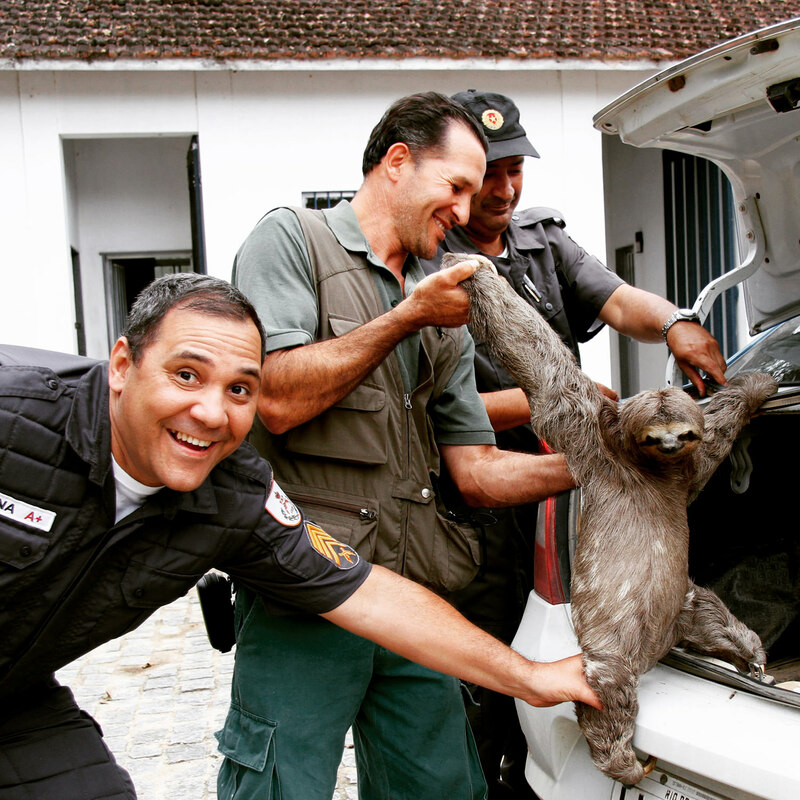 The behaviour of the sloth is very well known. The male sloth can be readily identified from a bright orangey yellow patch in the middle of its back. Often we find a mother sloth with single offspring strapped on her back like a rucksack. She likes to raise her baby up for to 9 months, and then abandons the adolescent sloth to find new territory. Sloths are mostly motionless, which allow for greenish algae to settle on their fur, from which they are said to have their own ecosystem and said to eat mostly at night getting water from browsing green plant shoots. Having stopped the traffic, his rescuers finally managed to persuade him to get into the back of their car, not an easy feat because of his extremely long arms and strong claws. Then he was brought to Regua to a safer habitat. As mentioned before, natural habitat of the sloth is forest, where there is an ample supply of buds and leaves which form his staple diet, and so he was released in some Cecropia trees where he ´quickly´made himself at home amongst the cover of the highest branches. Lets hope he soon finds a lovely lady sloth to raise a family with in the recently planted reforestation areas at Regua. Should you wish to see a sloth, REGUA offers a large steadily recovering habitat, with many food plants available. So join us, and do come and see one for yourselves! Copyright © 2018 Puro Fairtrade Coffee. All rights reserved.